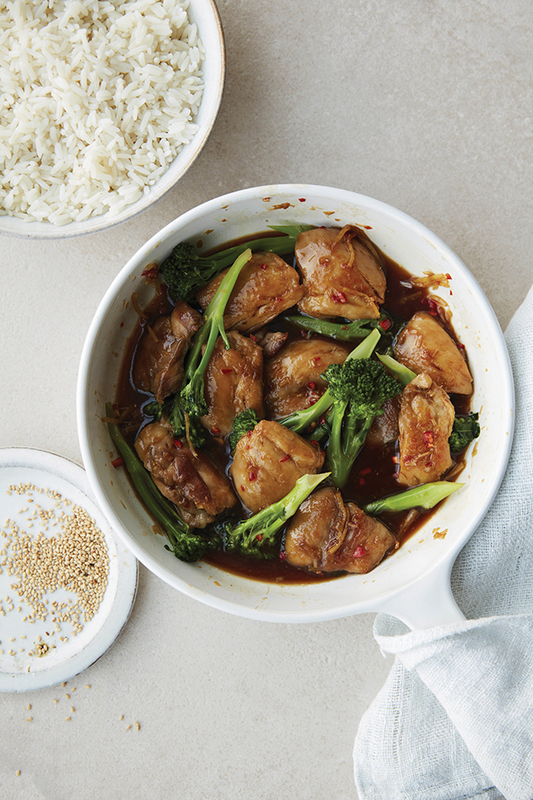 This traditional Vietnamese-style caramelised chicken recipe promises a dish that perfectly balances a bittersweet caramel with salty and spicy flavours. Prepare and cook the rice according to the pack instructions. Meanwhile, put the sugar in a small pan with 100ml (3½fl oz) water, then warm over a medium heat until the sugar has dissolved. Add the lemongrass, ginger and chilli, bring to the boil and simmer for 3-4 minutes until syrupy. Remove from the heat, then add the soy and fish sauce, plus the lime juice. Set aside. Heat the oil in a large pan over a high heat. Fry the chicken for 5-6 minutes, until it takes on some colour. Add the broccoli and fry for 2-3 minutes more, then add the sauce and cook, stirring, for 2 minutes, until everything is nicely coated. Ensure the chicken is thoroughly cooked until there is no pink meat and the juices run clear. Serve with the jasmine rice and toasted sesame seeds. This recipe can also be made with prawns or chunks of salmon; just fry them for slightly less time than the chicken.